Special mobile display units and bookcases with oak veneered end panels and tops are features of the recently completed library extension. 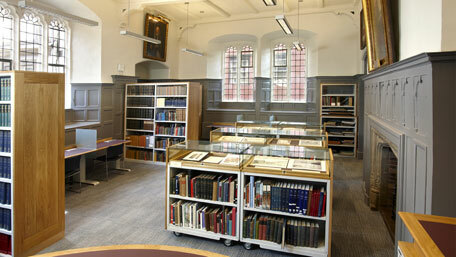 The extension has been designed by Marcus Beale Architects, and the display units and shelving supplied by Ecospace. A particular design requirement was the ability to provide mobile book storage combined with a display facility for documents and photographs. To satisfy this, Ecospace developed and manufactured special low units which incorporate its FOREG adjustable shelving system with veneered panels, castors and lockable glass display units above. When the area is to be used for seminars or lectures, these units are easily moved to the perimeter to create extra space. Said James Donlon of Marcus Beale Architects: "Ecospace has provided a flexible approach to support the character of two very different MBA library projects, this one and the London School of Pharmacy, and has delivered high quality shelving systems in both instances."